Ronald W. Francis G and Steven D. Penn G will appear before the Committee on Discipline facing charges of assault and assault and battery on a police officer. Penn and Francis assert that the cases are discriminatory and not grounded in factual evidence, and that the true motivation for the hearing is political harassment. The exact date for the hearing has not been set, Penn said. "The disciplinary cases . . . exist solely for the purpose of harassing Francis and Penn for their long-standing willingness to express their political viewpoints," according to a pre-hearing motion for dismissal, which Penn and Francis submitted May 1. The two also submitted pre-hearing motions for discovery and for an open hearing to COD Chair Sheila E. Widnall '60, who denied them. 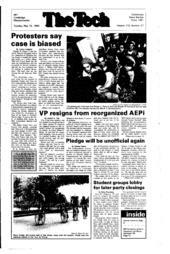 The charges stem from Campus Police statements on a March 2 demonstration organized by the Coalition Against Apartheid. During the protest, demonstrators called for divestment in front of the home of President Paul E. Gray '54 and in the lobby of Building E52, during an MIT Corporation meeting and luncheon. The police charge Penn and Francis with assault, claiming they "led a rush of demonstrators into [the] elevator at E52," and that this rush "caused an injury to Officer Rosie Sanders." But Penn and Francis said they did not lead the group into the elevator, and they will submit as evidence photographs that show they were not the first demonstrators into the elevator. In an attempt to enter the sixth-floor Faculty Club, where Corporation members were eating lunch, eight demonstrators occupied the only elevator that was programmed to go to the sixth floor. Francis is also charged with assault and battery on a police officer for allegedly kicking Officer Robert J. Molino while demonstrators were trying to enter the sixth floor from the stairwell of E52. Francis has denied kicking Molino. The police charge that the two demonstrators violated section 3.33.3 of MIT Policies and Procedures, which states that "all members of the MIT community are expected to conduct themselves with proper respect for one another and for each other's property." Campus Police Chief Anne P. Glavin said she took the charges to the COD, rather than through the public judicial system, because "no arrests were made" the day of the demonstration. Widnall "decided a hearing [was] warranted" after reviewing the Campus Police complaint, Arnold R. Henderson Jr., the dean's office staff support to the COD, told Penn in a letter dated April 3. One thrust of Francis and Penn's defense is that other motives exist for the charges against them. "I don't think we can deal on merely factual defense; we also have to question why it is these charges [are being] brought up in the first place," Penn said in an interview Sunday. Also, "the fact that these cases are solely motivated by reasons of political harassment should be apparent from the sheer lack of credible evidence" presented by the Campus Police, Penn and Francis state in their motion for dismissal. "There should be some evidence that distinguishes our actions" from those of the rest of the group, Penn said, because they were the only two arrested. He added that Glavin has to provide that evidence, and she "cannot do that." The Campus Police report identifies several of the demonstrators in the elevator. But Glavin would not "comment publicly" on the fact that Penn and Francis were the only two charged with causing Sanders' injury. Last month, though, she said they were the two charged because they were "the ones [Officer Sanders] could identify." In Sanders' own account of the events, she identifies one demonstrator and describes two others. Penn and Francis also said MIT brought the case to take time away from their school work and, in particular, from their political activities. They have named Professor Frank S. Jones and Adjunct Professor Melvin H. King, both from the Department of Urban Studies and Planning, as advisors for their case. In any COD case, the accused students are allowed "the right to assistance in preparation of [their] defense." Penn and Francis asked King and Jones to speak on their behalf because "these are respected professors," Francis said. The pre-hearing motions, which Widnall denied, were an effort by Penn and Francis to apply Massachusetts state laws to their case. To stipulate that "the COD must comply with the basic procedures established by the Commonwealth's judicial system," their motion for dismissal cites the Massachusetts Civil Rights Act, which "in part guarantees the basic civil rights to employees, students, and clients of private institutions." In a court of law, a motion for dismissal would be considered before the hearing. However, the rules and regulations of the COD do not account for the possibility of pre-hearing motions. In a given case, the only statement accepted from an accused student is a written response to charges against him or her. In a letter to Penn, Widnall denied the motion for dismissal, and claimed that it "raises factual issues which must be decided on by the [COD] on the basis of evidence at the hearing." Their pre-hearing motion for dismissal also cites the collaborative nature of the Campus Police report, stating that the reports were not "the officers' original or individual viewpoints." Penn and Francis also submitted a pre-hearing motion for discovery, which in a court of law would give them access to all evidence possessed by the prosecution "that may be useful in constructing their defense," according to the motion. The COD "will furnish [Penn] with all photographs which the MIT Campus Police intend to introduce as evidence during the hearing," according to Widnall's letter, as well as a list of witnesses that will be called to testify. Widnall otherwise denied the motion for discovery, though, because it "requests information outside the scope of the hearing." The students will not be given access to photographs the Campus Police do not introduce. The motion listed 10 items Penn and Francis considered relevant to their case, such as records of their political activity on campus, written and verbal discussions of them and the CAA, and "all photographs and videos taken since January 1" by MIT employees, "specifically members of the MIT Campus Police, of [CAA] divestment demonstrations, or participants." Widnall did not agree to accept Penn's photographs as evidence, he said, unless he provided her with the complete roll of film taken at the scene of the demonstration. They submitted four photographs, which show events happening on the sixth-floor stairwell and the crowded scene in front of the elevator. Widnall is not required to follow a specific procedure for evidence. The "formal rules of evidence that apply to civil judicial processes shall not be applicable" to COD hearings, according to the COD rules and regulations. Glavin said the Campus Police would turn over "whatever [evidence] the COD chair asks for." Widnall also denied the pre-hearing motion for an open hearing, which Penn and Francis submitted April 30. Widnall denied the motion, because all COD hearings "are closed to individuals who are not directly involved" in the hearing, according to COD rules and regulations. Penn and Francis argued that the hearings "should be made open to the community," according to the motion for an open hearing. "To close this case to the public would directly violate Commonwealth statutes and the principles of the university. . . . [We] would welcome a public hearing," Penn and Francis state in the motion. "Moreover we believe that the hearing, if it is not open to the public, will not receive adequate community scrutiny." In an interview last month, Widnall would not discuss the case against Penn and Francis. "It's a serious right of privacy for students," she said. Widnall was not available for comment yesterday.